The world now has a choice of Sonos vinyl systems | What Hi-Fi? Sonos has partnered with San Diego-based audio brand Wrensilva for two music systems that marry Sonos’ streaming platform with vinyl playback. The Wrensilva Sonos Edition Console ($5000) is an all-in-one system with a turntable and two built-in Sonos Play:5 speakers, while the more compact Wrensilva Sonos Edition Loft ($2500) features a deck and is designed to be used with existing Sonos speakers. If products that blur the line between hi-fi and furniture had their own category (can we chuck “furnifi” out there? ), the Wrensilvas would no doubt offer the most eclectic blend of old and new features within it. Naturally, the Sonos platform allows streaming of music services such as Tidal, Spotify and Apple Music, and lets users group the Wrensilva systems with any Sonos speakers on the same network. The onboard volume dial also wirelessly syncs to the Sonos app. As for the decks, both the Console and Loft feature Ortofon OM5E cartridges fixed to an OA2 precision Gimbal tonearm, on an acrylic platter. Expanding their versatility beyond network streaming and vinyl playback are 3.5mm and RCA inputs. 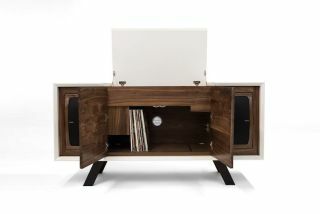 And, not forgetting their furniture alter ego, they also have built-in storage good for holding up to 120 LPs. While in the Console, the two Play:5s look a little like they've just been shoved into two drawers - but Wrensilva has acoustically damped the speaker compartments to isolate vibration. The best-sounding piece of furniture out there? That’s down to those prepared to spend $5000 to find out.